For many vegetable gardeners, having everything growing in perfectly straight lines, boxes, and neat formations is one of the appeals that they aspire to. There is nothing like the sight of a beautifully conditioned and formal vegetable patch to inspire the growing mood. However, if you want to really utilize space as best you can then creating a vegetable bed using the three sisters’ method is ideal, but it also means that you will have to embrace a somewhat messy looking style of gardening. Growing vegetables following the three sisters’ method originated as a form of horticulture created by Native Americans, long before Europeans found their way to the continent. Using three different types of complimentary crops, vegetable patches were created in small areas which not only maximized the use of space but provided as much harvest from the land as possible. Using corn, beans, and squashes, a relatively tiny plot could offer a large amount of food for the residents over a number of seasons. Such a good method was the three sister process that it was taken up by vegetable growers around the world and gardeners continue to use it today. For any vegetable garden, growing corn, beans, and squashes in this way allows for a large yield to be gained from a small area. Simply plant corn as you normally would, ensuring that rather than sowing in rows it is planted in groups to increase cross pollination. After several weeks, when the corn stalks are thriving, beans can be planted in the soil around the bases of the corn stalks. Gourd seeds, including pumpkins and squashes can also be planted in the patch, a little further out from the beans and corn, completing the three sisters’ bed. You will soon find that, whilst this vegetable method is far different from the formal and neat traditional growing format, the plants will thrive with very little help. As the bean shoots emerge they will quickly scramble across the earth and up the stems of the corn to reach the light. 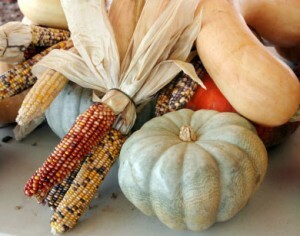 Gourds will grow similarly, with their shoots winding across the patch and intertwining with both the beans and corn. Pollination is greatly successful in this scheme as there are a multitude of flowers from all crops for insects and bees to visit. Meanwhile the planting method also helps protect harvests, with the beans and corn in particular helping ward off gourd borers which can ruin crops of squashes and pumpkins. Embracing the untidiness and unruliness of this planting scheme can be hard to do at the beginning, with it remaining very tempting to try and neaten up the vegetable patch a little. A rambling patch of leaves and crops is not for everyone, and many see the garden as a failure in terms of proper vegetable gardening. However, sometimes leaving nature to take its own course works best, and without the normal “interference” you will find that certain crops flourish best when left to their own devices. Whilst the rest of your garden may be clipped and perfect, allowing one small patch to go wild will reward you with a large amount of harvest for very little work. Geoff Wakeling is a writer with Brookside Patio Furniture which specializes in outdoor chaise lounge chairs which can be conveniently stored during the winter in a recommended facility such as Toledo storage. I am not concerned about a messy look – I am wondering about the practicalities of harvesting. How do you pick the beans in that mass of vegetation? How do you get to them without crushing something else? Or do you choose beans that are intended to dry on the vine? How do you tend the developing squash? Some need to be raised up on bricks, or hung in slings. When you select varieties, do you try to have everything be ready to harvest at once, so you can just clear the whole patch at once? Do you have specific varieties to recommend? Those are great questions Matriarchy. I think the most practical method would be to plant varieties that could all be harvested together but that wouldn’t be the only way to succeed with a Three Sisters planting. The Native Americans probably would have been growing varieties of dry or field corn along with beans that could be allowed to dry on the vines and winter squashes that would not need much attention until they were ready for harvest. The squash or pumpkins would ramble along the ground for the most part and wouldn’t necessarily need to be raised or hung. There are lots of heirloom beans that could work well in this setting, I would look for pole bean varieties that are recommended for use as a dried bean. I’ll be exploring some field type corns for use in flours and meals over the winter and will let you know if I come across any that are especially suited to this purpose. As far as the squash is concerned there are plenty of winter squashes such as hubbards, cushaws, butternuts, acorn, various pumpkins, and many others that would be perfect. Popcorn might be good, since it is intended to dry. I have plenty of winter squash seeds, which is one of the reasons I am interested in this plan. I just need to find corn and beans to match. I have not grown corn before, not wanting to waste the space if it didn’t work out. But this spring I hope to have a community garden plot and was planning to grow a lot of space-consuming squash. I could experiment with growing corn and beans at the same time. Just have to work on early weed suppression, since it will be hard to weed a tangled patch later on. Mulching and the heavy vine coverage should help keep weeds down later in the season. Popcorn would probably work but I would look for tall popcorn varieties to support the climbing beans… then there are flint corns, dents, and some of the specialized varieties intended for making flour. A great book that you may be interested in is “The Resilient Gardener” by Carol Deppe. She has separate chapters of the book that are devoted to squash and pumpkins, beans, and corn. Carol also covers uncommon but what she considers to be exceptional varieties of corn and squash, as well as traditional Native American methods of cultivating, harvesting, storing, and preparing these crops. Hi, I’m sort of late to the party, I just stumbled on this post today. Great site, by the way, very informative! I’ve used the “Three Sisters” method for several years (although I didn’t know it was called that) to save space in my garden. I plant sweet corn, Kentucky Wonder pole beans and whatever pumpkin varieties that catch my eye that year. I plant the corn in short rows, with every row being just wide enough for me to work in comfortably. That way, I can easily weed between the rows. Sometimes when I feel lazy I just get out the weed wacker and mow down everything that isn’t corn, green bean or pumpkin, then actually hand weed around the veggies. Since I stagger the corn plantings, I also end up staggering the beans and get a pretty consistant harvest throughout the season. I start the pumpkins at the edge of the first row of corn, then “encourage” the vines into the corn. For harvesting, I just take off whatever ears of corn I want and leave the stalks up for the beans. It’s a great system and has worked really well for me through the years. Thanks for writing bout it! Doesn’t the beans growing up the corn strangle the corn? Also how do you time the planting of the corn and the beans so the corn has time to strengthen? Hi Bob, the beans may look like they would strangle a crop but I’ve seen them climb up a lot more delicate plants than corn and they didn’t seem to do any damage that way. On the timing I would plant the corn first and then follow with the beans and squash after the corn seedlings were up and established. Thanks, Kenny – the Carol Deppe book is already high on my to-read list. Shannon, thanks for talking about how you weed – I was imagining a dense mat of vegetation that would be hard to weed. And I did not think about spacing out the plantings to get successive bean harvest all summer. I think I have secured the community garden plot, where I plan to try this method. (Don’t have enough room with full sun in my yard.) I have heirloom popcorn from a seed swap and a local heirloom neck pumpkin – still selecting a bean variety. I am going to edge the plot with herbs and some cutting flowers. I will take photos and let you know how it goes! I’m a first-time gardener, excited by the three sisters idea, but I have only a 5′ x 12′ raised bed, and I’m wondering how much space the three sisters would really need to be viable. I’ve heard that you should space out the corn plants in mounds (4 plants per mound) on mounds 5′ apart from each other… is that true? I’d also like to grow some tomatoes, basil, and maybe a sunflower or two. Is this a pipe dream for a plot my size? I’d really appreciate some advice. Barbara, with that sized garden I don’t think that it would be very efficient to grow corn unless maybe if you wanted to devote the entire space to a “Three Sisters” garden. Corn is best grown in wide blocks with the plants spaced out equally (not in mounds) to allow for better wind blown pollination to circulate amongst the plants. You could plant some corn in a block at the end of you bed and follow the three sisters idea… the corn would function fine to support the beans, and the squash or pumpkins would grow as intended, but you probably won’t get much of a harvest from the corn itself. I would recommend that you grow a tomato or two along with some more compact vegetables like peppers and root crops such as carrots and beets. You could even fit in some bush beans or a squash plant. Another idea is to increase your production by building a trellis where you can take advantage of the vertical space with crops like pole beans, cucumbers, small melons, and other climbing vegetables. You can tuck basil and other herbs in wherever there in a little open space but don’t try to crowd too much into your garden to where the plants won’t have enough room to spread out as they grow and mature. Good luck! Great web site. Thanks for the effort. Have you tried the square foot (matrix) methods? How would they work for the 3 sisters? I have had good yield from an early spring garden with this planting style. This is my first year of gardening, but was able to produce broccoli, collards, lettuce, carrots and radish for a family of 4 from 2 4×8 boxes. YEAH!! I am planning to expand and would like some ideas or guidelines for the size required for the 3 sisters. The “Sisters” make sense and I love corn and beans!! I would like to use yellow crookneck squash in place of pumpkins, etc..
With great info like this one could learn to feed themselves!! I’m a novice at vegetable gardening – I just want to thank you for this great web site. I am learning so very much!!! I would like to plant kidney beans instead of green beans – is that possible? I was wondering if there are other plants that I can plant to help protect my plants from harmful insects? I have moles in my yard and red ants galore. Want to keep my garden organic but not sure what I can do…any suggestions? Hi Lisa, I think that most of the current types of kidney beans are the bush types. The Three Sisters method is intended to be used with the climbing pole bean varieties. Thanks, and God Bless you also! Regarding the ants you can try sprinkling cinnamon to help deter them. There is a plant called mole plant that is supposed to help discourage moles… but I can’t say for sure how effective that is. I have 3, 4 by 8 raised no dig plots I am gong to use for the 3 sisters. I am guessing 4 minumum 3 sisters per plot( somewhat centered), or can I do 6? also I am not much of a squash person, so was thinking of using melons and/or cucumbers or some other crawling plants. advice? Hi Jim, I would think that you can get two to three dozen corn stalks, at least a dozen bean stalks. and one or two squash plants in each 4×8 bed. Pumpkins or melons should work in a Three Sisters planting, but cucumbers may not work as well. I saw the other question about the 5′ wide bed and had a couple other questins for a 5′ wide bed that’s 30′ long. Space lengthwise isn’t much of an issue. I was wondering what the most efficient way to set it up would be. Would putting two blocks of corn widthwise with beans around the perimeter and a mound of squash between pairs of blocks work? Would rows or corn work? Any help help would be appreciated. Next post: Are Seed Catalogs Growing Obsolete?